"All of my agricultural pursuits have been based on being someone who likes to cook but gets frustrated by the lack of ingredients, especially those that are native to the New World. It seems to me these indigenous ingredients should be familiar, if not common but instead our own food is considered exotic and sometimes in danger of being lost as we pursue a watered down Euro-centric diet. American cuisine seems to be in a position of re-inventing itself and I'd love to include ingredients, traditions and recipes from south of the border as part of the equation. I love the concept of The Americas. I feel as if it's just as important as the European heritage many of us share. Of course you don't need to know where food originates in order to enjoy it. 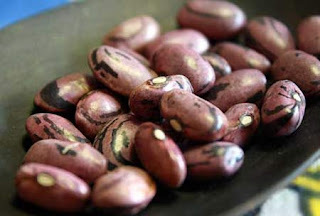 The beans are amazing and work in almost every cuisine. Their roots may be Mexican but can you imagine anything more French than the Flageolet bean? Borlotti may be the pride of the Piedmont in Italy but they wouldn't exist without their roots in Colombia. " so he began working with local farmers to grow heirloom beans and other ingredients. he started selling at the san francisco ferry building farmer's market and was quickly discovered by many local chefs who became fans of his products. today it is very common to dine in restaurants which emphasize quality local ingredients and see rancho gordo beans on the menu...specialty food shops began carrying the brand...and steve sells on his website...but a highlight for me was last year when he opened his shop here in napa...at last...i can buy the beans as often as i want. last time i visited rancho gordo i bought three kinds of beans and a bag of posole (hominy). i am going to create a different recipe for each type of beans and post to the blog. i also plan to share more of steve's story with you...he is doing some amazing things...as an example his rancho gordo-Xoxoc project helps small farmers...this deserves a story of its own. i decided to make my dad's beans...but use the rio zape instead of pinto. rio zape taste a bit like a pinto but with hints of coffee and chocolate. steve sando says "this is the bean that started the whole thing" he tasted one and started the company...definitely the first one to share with you. meanwhile, sauté onion and carrot in olive oil until soft. add jalapeños and sauté for another minute or two...do not season.once beans have completed their soaking time add onion mixture to the stockpot. add beer and stir. beans should be covered with about an inch of liquid. add additional water if needed. bring to a boil for five minutes and then lower heat to simmer. cook until soft (this can take between 1-3 hours). once beans are soft...season to taste with the sea salt and pepper. i look forward to sharing other recipes using rancho gordo beans...in the meantime...what is your favorite way to prepare/eat beans? regarding the grapeseed oil question...if you don't have this ingredient in your pantry stop everything and go get some! o.k...even i think that sentence sounds a bit melodramatic. but really...how have i missed this for so long? regular readers are very aware of my addiction to extra virgin olive oil...i use the stuff in everything. 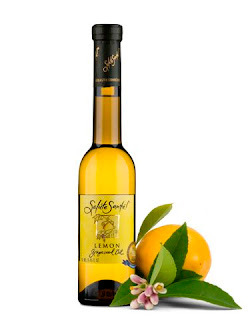 but i have met the owners of salute sante!...a local grapeseed oil company...a number of times when they visited studio-store. then, i ran into them last month at the fancy food show...they had a booth...and i actually had the opportunity to hear about their company and taste their products...hi?? a local, green, organic, eco-friendly company producing a delicious, healthy and convenient product??? how perfect is that for napa farmhouse 1885™ ? "...long been the secret of gourmet chefs who love its light and nutty, yet neutral flavor. It has the unique ability to enhance the flavors of ingredients instead of overpowering them and leaves no greasy aftertaste! It makes savory marinades and salad dressings that will not cloud when chilled, so you can use them right out of the refrigerator. The high smoke point (485 F) makes it ideal for hot food preparation which means you can sauté, fry or bake without any smoking, splattering or burning. The excellent emulsification properties make it ideal for whipping mayonnaise and creamy dressings that will not separate when chilled..."
i have been longing for summer! it has been cold, grey and rainy for the past month... i just want sun...and summer produce...like tomatoes...i really want tomatoes. but i only eat fresh tomatoes when they are in season..otherwise, why bother? they taste terrible. i love taking fresh tomatoes and slow roasting them with evoo, garlic, herbs and sea salt...amazing. last week, i decided to try slow roasting excellent quality canned tomatoes to serve on bruschetta...but this time, i only wanted the tomato taste...nothing else...so i used san marzano tomatoes (i think they are the best quality canned tomatoes available...and note...these are tomatoes grown in san marzano, italy...not a brand name) and drizzled them in the grapeseed oil with a bit of grey salt...no herbs or garlic or evoo taste. 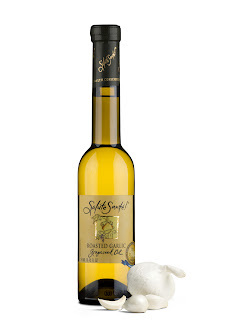 wow...fantastic...super sweet with a big tomato taste...a perfect choice for mid-winter...and an example of a good time to use grapeseed oil. preheat oven to 225 degrees. open tomato cans and strain through a colander...reserve the juice for another use. spread the tomatoes on a parchment or silpat lined baking sheet. drizzle the grapeseed oil over the tomatoes and sprinkle with the salt. roast in preheated oven for 4-6 hours or until the tomatoes have lost most...but not all...of their liquid. when the tomatoes are ready, serve them however you like...on top of the grilled bread? tossed with pasta? a side dish with scrambled organic eggs? if you are like me, many will be eaten straight off the baking sheet...never making it to a finished dish.... so...there you go...a recipe for the grapeseed oil....there is so much i could tell you about the newest addition to my pantry...remember i told you this was an eco-friendly company? what if i told you they use used grapeseed oil to power their vehicles?? or maybe you would be interested in the line of infused grapeseed oils...lemon, roasted garlic, basil or rosemary..so, so good. this item deserves another post and...since my goal is to tell you the stories of the artisans who produce the items for my company....i am going to interview the founders of salute sante! and share some of their delicious recipes. for now, try the tomatoes....and consider adding grapeseed oil to your pantry. please visit our website for additional details or to purchase...and yes, we carry the products at studio-store. here's to spring coming early this year!! !